The Minute Weaver is designed to self teach the very basics of weaving in 30 minutes or less. It is teeny tiny and super quick. This is ideal for users who may not want to spend too much time or money in a class or on a larger, more complicated loom product before having a basic understanding of weaving. The results are micro 2" squares that can be stitched together for a larger project. • Minute Weaver Set comes with all three gauge sizes, step by step photo instructions, metal tapestry needle, wee (2") weaving comb, cotton carrying bag and yarn keeps. Medium (M8) - 8 slots or 4 ends per inch (e.p.i ) - ideal for working with dk, worsted or bulky weight yarn. The thicker yarn means the weaving is much quicker. Requires about 3 ½ yards dk weight yarn. The Medium size not recommended for embroidery threads. Fine (F16) - 16 slots or 8 e.p.i - ideal for working with sock or lace weight yarn and some heavier embroidery threads. Uses about 6 ½ yards of a lighter weight yarn or thread. Extra Fine (EF 20) - 20 slots or 10 e.p.i- ideal for lighter weight yarns or embroidery thread. Requires about 6 ½ yards of lighter weight yarn or thread.All you need to provide is yarn and scissors. These looms are made of birch wood in our Houston, TX studio with materials purchased from U.S.A. vendors. Set of three Minute Weavers: Medium, Fine and Extra Fine. Minute Weaver Set comes with all three gauge sizes, step by step photo instructions, metal tapestry needle, wee (2") weaving comb, cotton carrying bag and yarn keeps. All you need to provide is yarn and scissors. 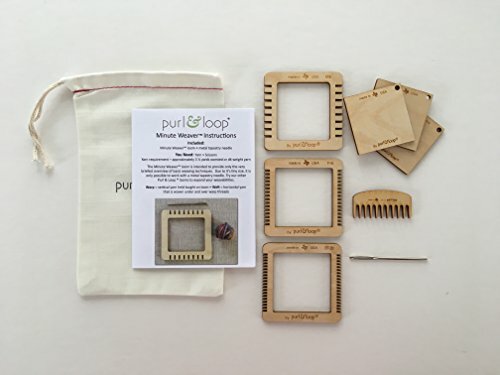 If you have any questions about this product by Purl & Loop, contact us by completing and submitting the form below. If you are looking for a specif part number, please include it with your message.